On the evening of Sunday, December 19, the Adobe Books staff are celebrating the 2010 holiday season from 5-10pm with spiked cider, hot popcorn, mulled wine, cookies and spirits. 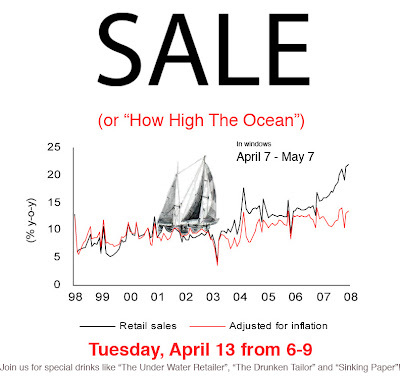 Photo-booth in the Backroom at 7pm, following a gift raffle and champagne toast at 8pm. Join us! 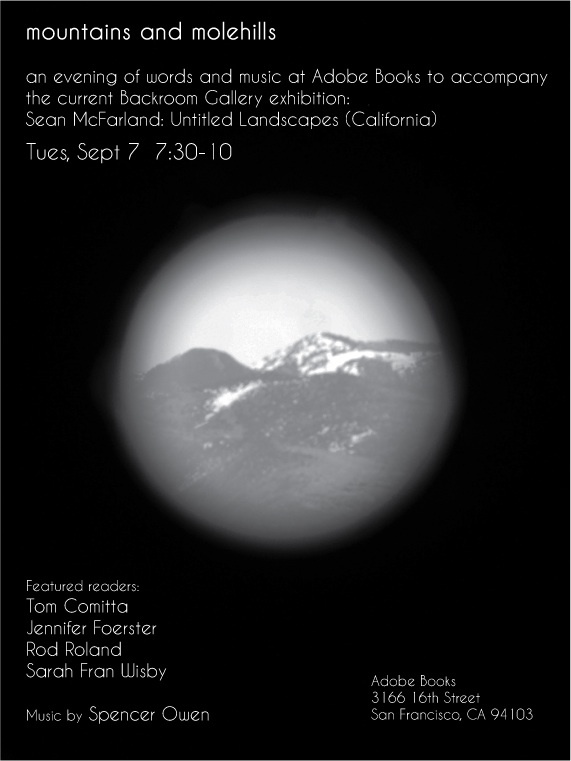 city reader: threnody for a lost landscape from justin carl hurty on Vimeo. City Reader is a publication for the pedestrian intending to expand the frame we live within, and to focus on the scale of the neighborhood. City Reader: threnody for a lost landscape a video by Justin Carl Hurty was produced during the Reading Conventions residency in the Adobe Books Parlor. 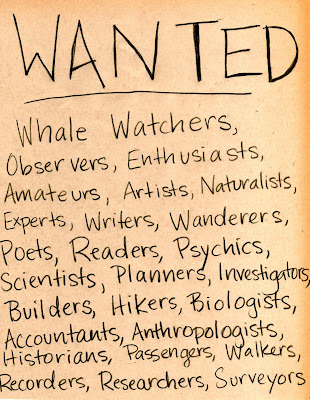 In the Adobe Books Parlor, the installation Whale Watch refers to the human inclination towards whale watching, and watching in general, which often elicits patience, reverence, and a sharp attentiveness, in order to allow for discovery. Within this clear objective, however, is the act of open-ended observation. 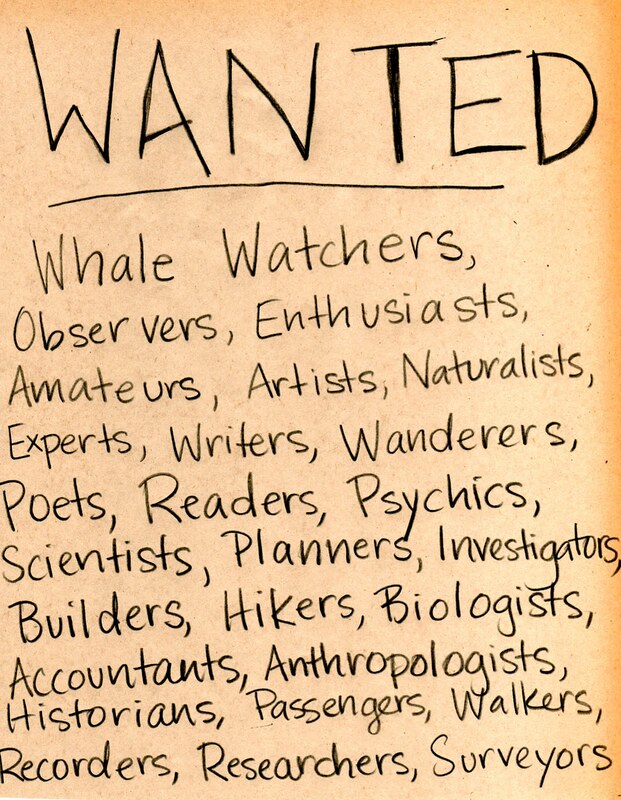 As a visual and participatory project, Whale Watch is meant to echo the act of searching and orienting present in the process of Understanding A Whale Fall by concentrating on the act of observing, through both representations and visitor contributions in logbooks in the store. 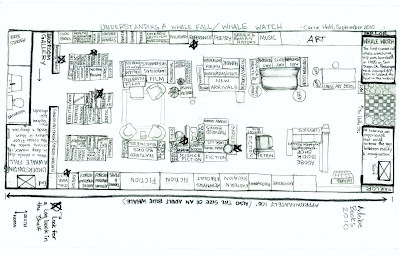 By bringing a focus onto the surrounding neighborhood and store visitors, Whale Watch weaves aspects of the current environment and local history with the broader investigations conveyed in the backroom. 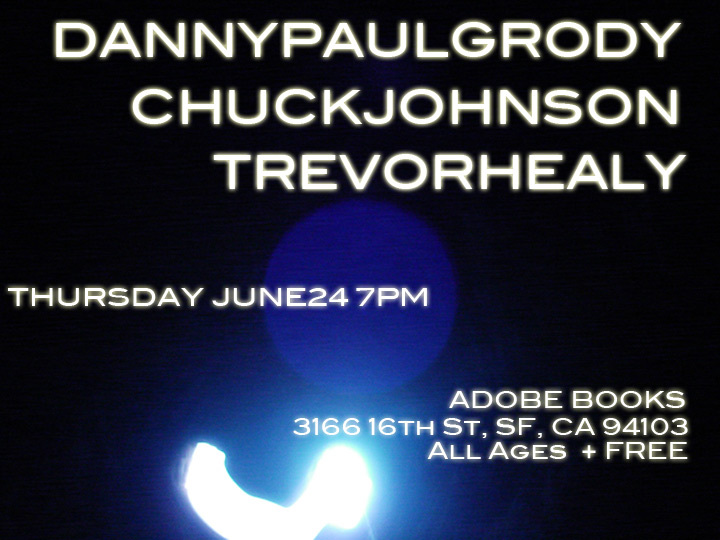 For the closing of the exhibition, you’re invited to actively watch in the surrounding neighborhood of Adobe Books. Carrie Hott will lead participants on a short walk through the Mission along a route of historical landmarks and sites of interest. Participants are invited to fill in the gaps with their own knowledge, stories, and histories to the walk as it goes, alternating their experience as guide and observer. Following the walk will be a reading about whales and whaling at Adobe Books. In addition to original pieces read by Carrie Hott, Kevin P. Clarke, and Christine Choi, Invisible City Audio Tour authors from their upcoming tour, The Armada of Golden Dreams, will preview their pieces. Armada readers will include Amanda Davidson, Jennifer Hasegawa, Jason Bucholz, and Dave Seter. Logbook contributors are invited to read their pieces as well. Understanding A Whale Fall recommended by Art Practical! This video is a documentation of a collaboration between Kelly Lynn Jones and Collin McKelvey in response to the City Reader Project curated by Julie Cloutier. 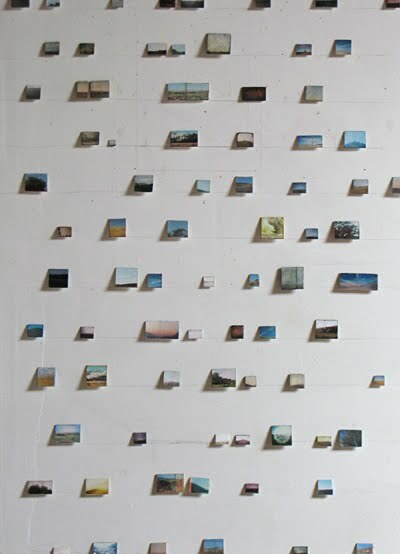 "Written in miniature and taken in aggregate, Untitled Landscapes (California) pulls off an affecting narrative sweep—one that might find you lost in the many moments that seem like memories you've had, but are actually those we all somehow share." –Brady Welch, Shotgun Review for Art Practical, 2010. 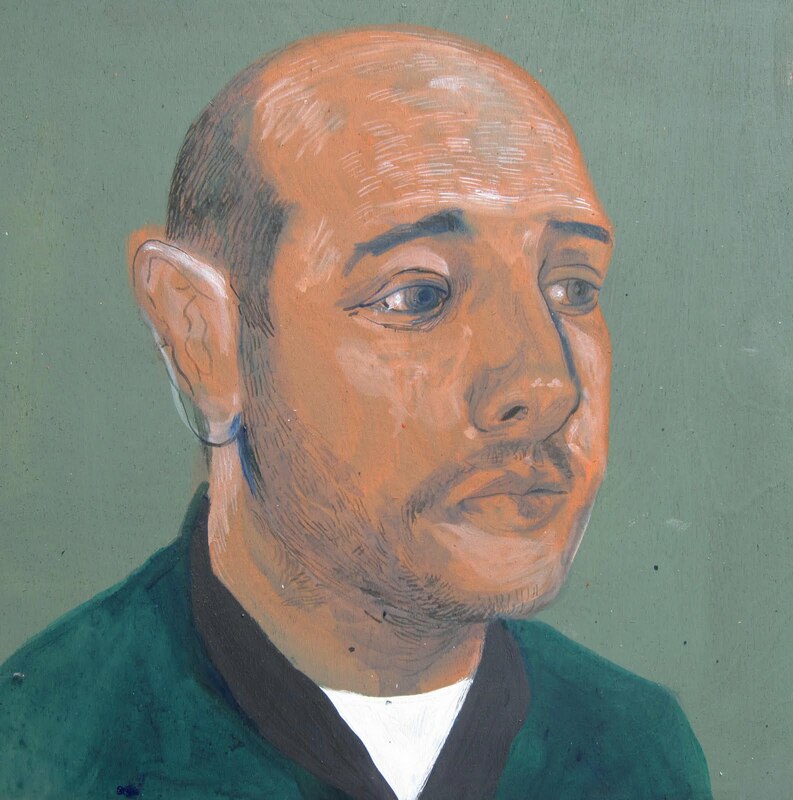 KYLE RANSON: Portraits is an exhibition of nearly two-dozen paintings of friends, artists, and other distinguished characters by Kyle Ranson. In his new body of work, Ranson creates a focal point of the time-honored artistic engagement with portraiture, dedicating each picture to a single sitter, artfully posed and cropped. Many of the portraits on view were commissioned by Andrew McKinley, proprietor of Adobe Bookshop, but rather than create an exact or idealized rendering Ranson retains his artistic style. The artist balances realism with mystery and distortion, focusing the portrait as a mode of artistic exploration as well as a contemplative marker of time. 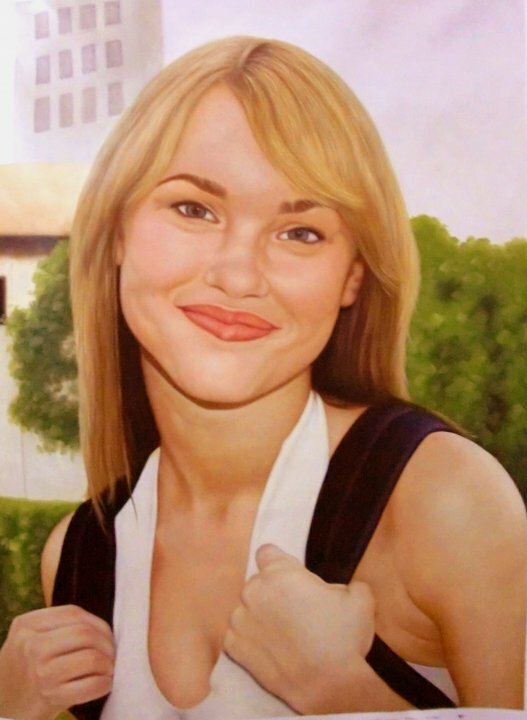 During the course of the exhibition, Kyle Ranson will set up a portrait studio in the storefront windows. Come down to Adobe Books and have your portrait drawn by the artist. Portrait sittings dates are July 19 to August 5 on Monday afternoons, 1-4pm and Thursday evenings, 7-9pm. "Adobe isn't just a bookstore"
Based on Beard's invitation to develop ideas on how an exhibition, or library, represents the search for knowledge, combined with the artist Torres' front-window examination of how urban renewal is experienced, the Backroom Gallery energizes profound reflections of the meaning and value of Adobe Books in the SF arts community. 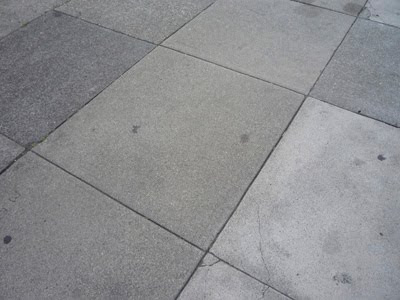 Brandon Brown, an SFMOMA Open Space columnist reflects on his past and present experiences of the store. Dena Beard's Lending Library is featured on Art Practical with a review by Elyse Mallouk. 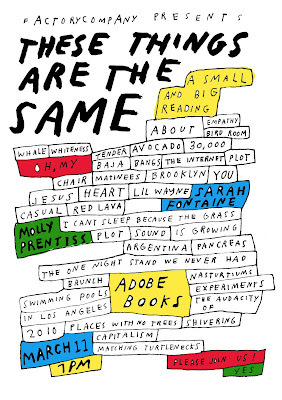 The writer successfully draws attention to the context of the bookstore; highlighting the nature of Adobe Books and the place that in effect frames the artwork the gallery engages. Lending Library is a group exhibition curated by Dena Beard featuring tools, materials, and resources from artists Amy Franceschini, Colter Jacobsen, Kevin Killian, Tom Marioni, Emily Prince, Stephanie Syjuco, and Christine Wong Yap. 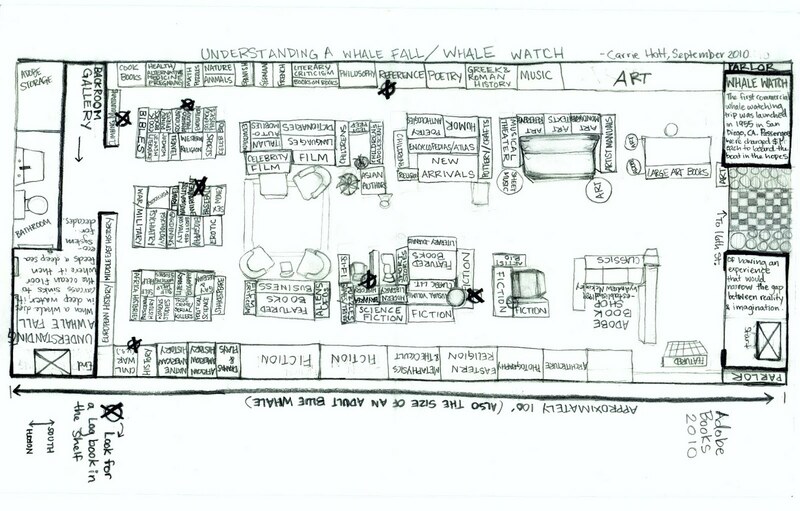 We browse the bookshelves of the Lending Library as cross-sections of artists’ studios or as a medium for us to consider how we navigate and reclaim information in our own research practice. Experiencing the scribbled margins of a Xeroxed essay alongside modified found photographs changes their context, allowing for more dynamic images and learned connections to arise. Although the originals cannot be borrowed, scans of the artists’ materials will be available to takeaway and appropriate. Nestled in the back of Adobe Books this, the second iteration of Lending Library, develops some of the ideas brought forward with Oakland artists last February at the Royal NoneSuch Gallery. As such, Lending Library joins the landscape of open-source, browser-friendly experiences available in the Bay Area, expanding the idea of how an exhibition, or a library, can respond to a personal, anarchic search for knowledge. 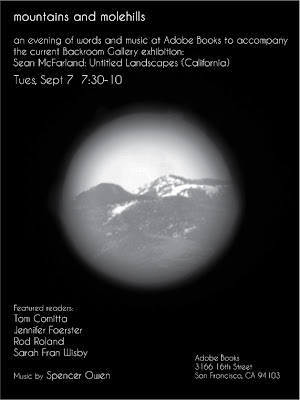 7x7 San Francisco Magazine's Kimberly Chun picks Adobe Books Backroom Gallery as 2010 Best Gallery Renovation. Last year's gallery expansion was made possible by the generous support of local artists who donated their work to Adobe's 20th Anniversary art auction in March 2009. The Backroom Gallery renovation was achieved by artists and friends of store including Randy Colosky, Andy Vogt, Chris Corales, Kyle Ranson, and Phil Crumar, and accomplished under the direction of Gallery Director, Devon Bella. Neighborhood Watch opens Friday, May 21, 7-9PM and runs through June 20, 2010. 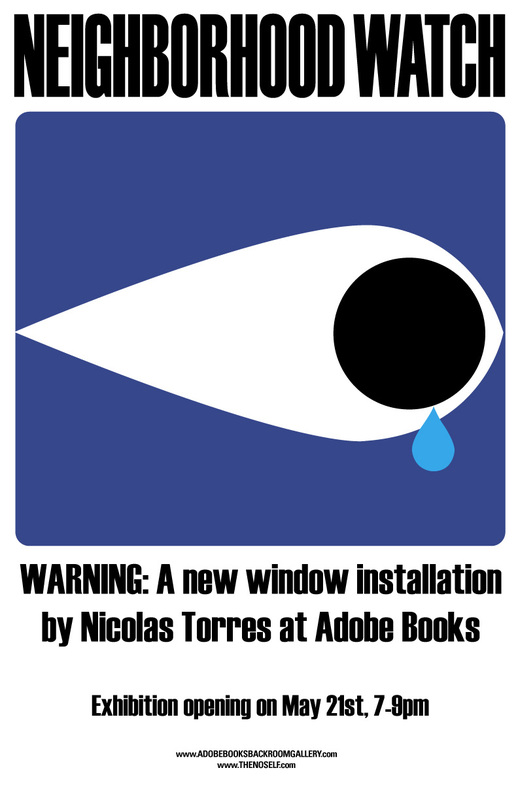 In Adobe Books Parlor, an exhibition venue in Adobe Book's storefront windows, Nicolas Torres presents Neighborhood Watch, an installation by the artist exploring – and exploiting – the accretive motion of a city’s attempt to eliminate urban blight. In a city where rigid class and racial borders once prevented individuals from traveling through certain neighborhoods, you now have many neighborhoods where culture and demographics can shift with the crossing of a street. 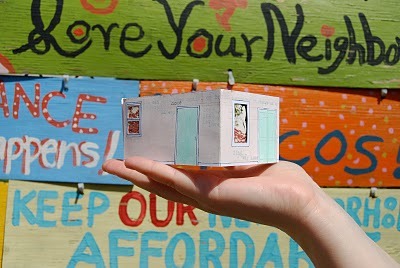 Along with the changing visual characteristics of neighborhoods, you have changing ideals. While one may see urban renewal as an attempt to beautify and improve previous conditions, another may feel that the benefits of urban renewal are disproportionately shared among its renewers. In any case, there are many stories to be told, and more importantly there are many stories being disposed of permanently. In his new installation, Nicolas Torres attempts to capture a few of the endangered ones. 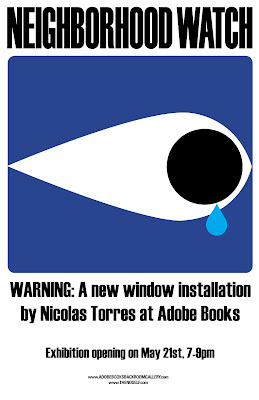 Nicolas Torres was born in San Francisco in 1981 and has lived throughout the Bay Area. Torres received a BA in philosophy from UC Berkeley in 2008. His parents and their struggles, have been the fodder and inspiration for much of his work. The Adobe Books Parlor is part of a long-term curatorial project that commissions artists to explore how the bookstore locates itself within the constant flux of the 16th Street environment. The series seeks to animate the intersections between private and public narratives, and among Adobe Books’ social and commercial spheres. 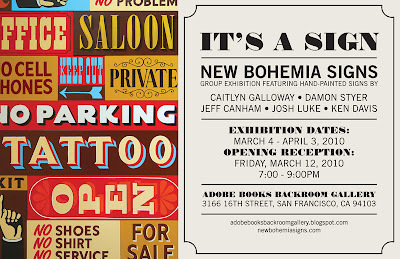 Adobe Books Parlor is curated by Devon Bella. 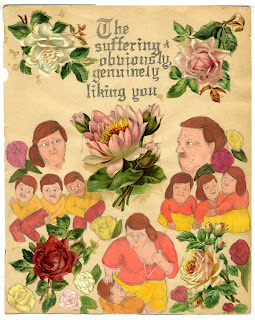 Parker Ito's solo exhibition, RGB Forever is featured on Artslant's gallery hop. Read Ava Jancar's review. 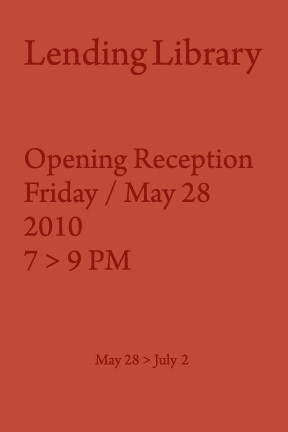 Multiple Interaction is a one-night only exhibition exploring the potential of five multiples from the collection of Steven Leiber. These include: Relationships (1991) by Damien Hirst, A Collection of Rooms, parts 1 & 2 (1997) by Dave Muller, Interview Game (1996) by Heather Lenz, Dyke Deck (1996) by Catherine Opie, and Magnet Ball (1996) by Uri Tzaig. The curator, Susannah Magers, has filmed the activation of each of these works and will present her five films along with the five multiples. The art term multiple can be defined as a work of art created for mass production, which can be produced in unlimited numbers without loss of quality or dilution of content. 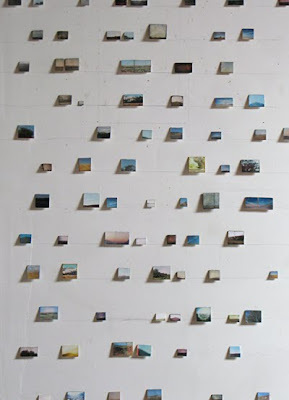 A multiple is commonly understood to be a small sculpture (an object) rather than a print or photograph. The multiples in this exhibition share this identity as smaller--but no less significant--extensions of their makers’ practice. 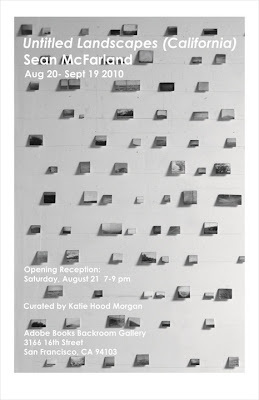 Participating artists include Colby Claycomb, Elinor Domol, Steffi Drewes, Josh Keller, Dori Latman, Cathy Lu, Michelle Morby, Hilary Schwartz, Heather Van Winckle, and The Center for Experimental Practice. Dessert is the moment of the meal when everyone is full. It is the time when conversation takes open-ended directions. Dessert is an opportunity for those who couldn't make it to dinner to stop by for a visit. It is a time of excess, pleasure and storytelling. For Dessert, each participating artist has taken up a different aspect from taste to etiquette to preparation to service. 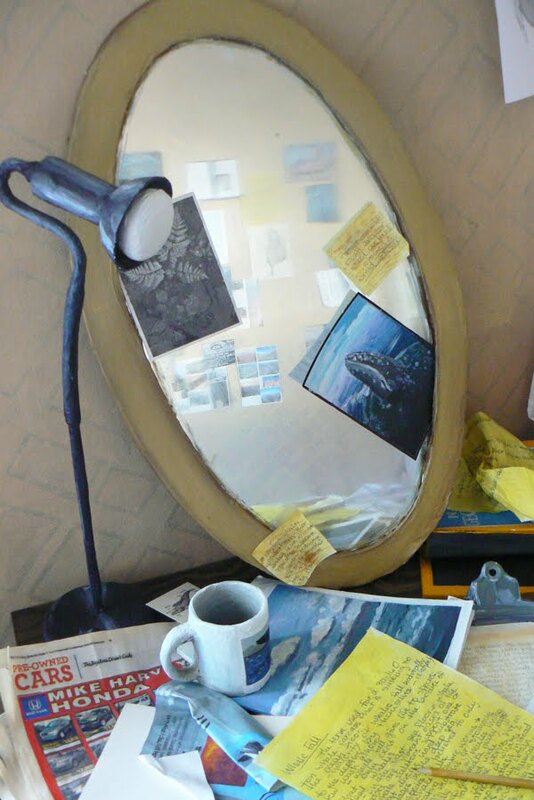 Artists will show a range of work including public reading and presenting, sculpture, installation and drawing. 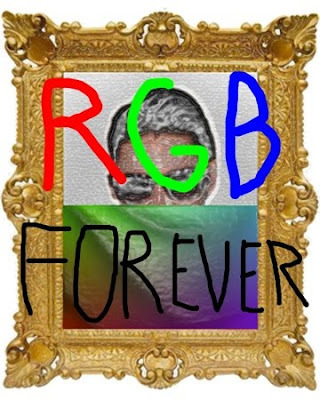 Adobe Books Backroom Gallery is pleased to present RGB Forever, Parker Ito's first solo exhibition. The title refers to RGB color space, an additive color mode viewed on all computer screens in which red, green and blue, combine to create over 16 million different colors. RGB is also Ito’s metaphor for new mindsets and attitudes about contemporary culture that have emerged out of the pervasiveness of the Internet. For Ito, the Internet is an abyss of readymade artifacts open for excavation, interpretation, and reclamation. In the Backroom Gallery, he will present painting and video works in which Internet ephemera salvaged from both high and low Web culture is translated into new forms. TASTE! is an exclusive, all-sensory tour sure to give you something to talk about. Three Bay Area-based artists converge in YBCA's Grand Lobby Apr 6-11 for a site-specific, collaborative installation using food, art and conversation to respond to the exhibitions on view in our first floor galleries. Each day the menu take you somewhere new, as will the topics for discussion. TASTE! is FREE w/ YBCA Gallery admission, and includes an interactive salon hosted by NIKI KORTH, handcrafted spring lemon elixirs by DORI LATMAN and a global papaya excursion with Chef TA-WEI LIN, curator of the "cultural liberation" brunch at Doc's Clock. Also on view in the Grand Lobby, unique furniture from select students in the graduate Furniture Program at CCA. Dinner can be solitary, in front of the television with a reheated slice of pizza. It can be on the go, with crumpled paper bags strewn across the back seat. It can be a meal shared with family and friends. Dinner, a live cooking event and exhibition, is a celebration of the moments when a simple plate of food becomes a landmark in one’s own life. The event and exhibition respond to the culinary and social means through which one is nourished. The exhibition includes drawings and video works. 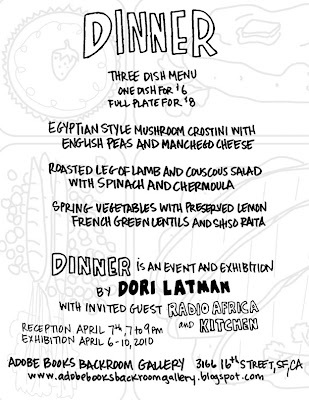 The live cooking event will showcase a three-dish menu freshly cooked by Radio Africa and Kitchen. 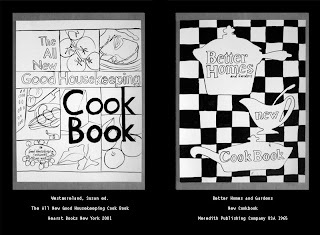 Together, these pieces highlight a range of approaches to cooking dinner. Chef Eskender Aseged, a Bay Area chef with over 20 years of restaurant experience, began Radio Africa and Kitchen by cooking meals for people out of his home. Though, Eskender’s project is of a scale larger than an intimate domestic space. He moves and adapts his operation for a variety of situations and places, from large dining halls, to outdoor spaces, to small cafes. It is those who participate in Radio Africa’s events that promote it. First, Dori Latman knew Eskender as her neighbor, though it was through word-of-mouth that she learned about his project. 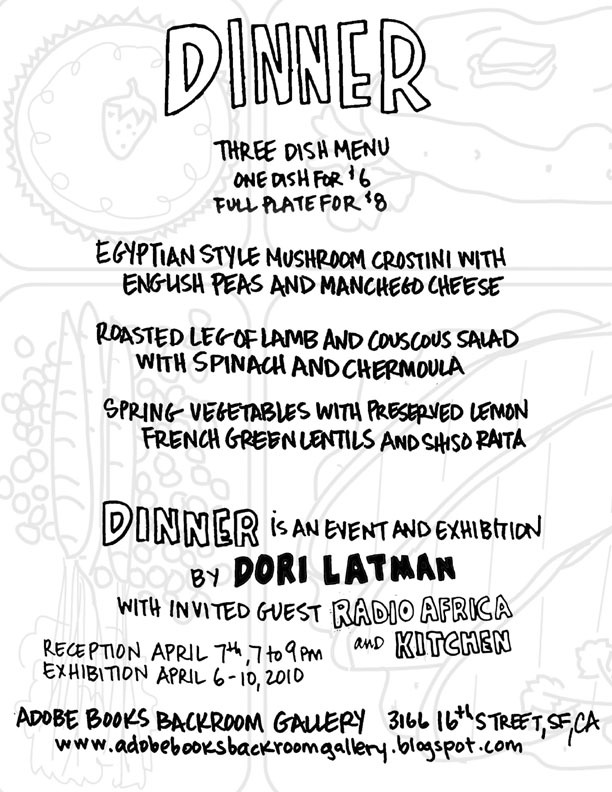 Dori Latman's interest in Radio Africa and Kitchen relates to the series of vending carts that she has developed for art exhibitions, serving food and beverages to gallery visitors. Latman experiments with intersections of art, food, and business as a vehicle for fund raising and social networking. She creates multiple versions of the vending cart for different types of events. 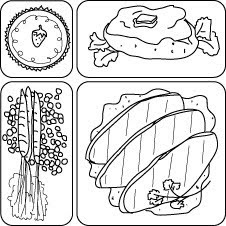 The foundation of this series has been built through experience in food service at cafes, bakeries, and outdoor festivals and with stretching the meaning of drawing and performance. The artist explores ideas of entertainment, consumption, labor, and culinary creativity. Learning about Radio Africa and Kitchen’s development and processes has been an invaluable education and source for inspiration. Many thanks to chef Eskender Aseged and Bi Rite Market for their generous donations of time and delicious food! Currently on display in the windows of Adobe Books are props, costumes, and remnants from Skillät Hans, a play originally performed at PLAySPACE Gallery on March 25, 2010, by a class of MFA students from California College of the Arts. 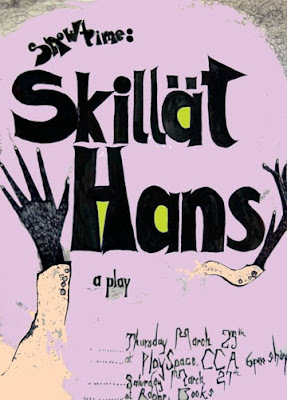 Skillät Hans is the story of a man with problems. He seeks pharmapoiticals to help him with his troubles, and winds up sleeping in the underground world of sweatshop production and human skinning. 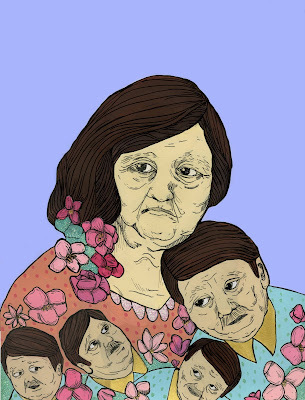 Skillät abandons life as a successful painter to make more socially conscious art. 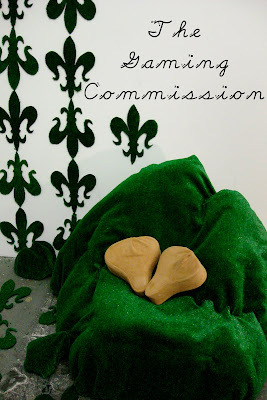 He befriends immigrant laborers and collaborates with them on a new body of work. Embroiled in kidney stones, brutality, stardom, pharmapoiticals and lavender, this smash-hit-sold-out-on-opening-night exhibition is set in current day New York City. The product of a three-week intensive collaboration, Skillät Hans is a play in which the characters are themselves enacted by characters. An exercise in personality switching and empathy, and a conversation on modes of artistic production, the play is evidence of the rare but serendipitous “organically democratic” success. Each player contributed ideas, adding upon collective agreements, all accepted though imperfect but collectively permitted consensus. Working in such a manner—rushed, without stringent conceptual editing—this process yielded an oneiric portrait that repeatedly folds over upon itself. The discussion of dream states, the fulfilled “dream” of the artist’s success, and the nightmare of confrontation with the ethics of production are astutely explored alongside the cathartic draining of unconscious thoughts—eloquent, grotesque, taboo—to produce not only a narrative, but also a miasmic state. Damon Styer presents a concise-yet-thorough demonstration of applying gold leaf to glass in the form of letters and numbers, for young and old alike, easy to understand in all but the mysterious chemical properties underlying its physical beauty! As part of the It's a Sign show, sign painters Jeff Canham and Caitlyn Galloway will be painting free custom-made protest and political posters at the Adobe Books Backroom Gallery. Signs, like any kind of advertising, and most of design for that matter, employ aesthetic concerns to achieve directive ends, if not only to tell you where to go, then perhaps to elicit an emotional response, often one conducive to the more rapid flexing of your purchasing muscles. The "signs, signs, everywhere signs" that ever increasingly break up the scenery, whether or not they're even so bold as to call attention to their own physical beauty, typically do so on behalf of some corporate entity, big or small, wishing you to ascribe whatever design sense is evident in the sign, to the quality of their goods or services on offer. The "language" of signage, meanwhile, encompasses a constantly evolving and multiplying variety of materials and methods to communicate ornately complex nuances of meaning to a bewilderingly polyglot populace. We sign writers, here at New Bohemia Signs, tend to focus more intently on some of the most rudimentary parts of sign language, or any language – the little squiggles, curves and strokes that form our alphabet. Our tool chest holds brushes, enamel, some gold leaf, and not much else. Individually and collectively, we harbor a cultured and intimate familiarity with, and to some extent, an abiding love for letter forms, which themselves take shape from the habits our limbs have fallen into, drawing and painting them again and again and again and again and again.